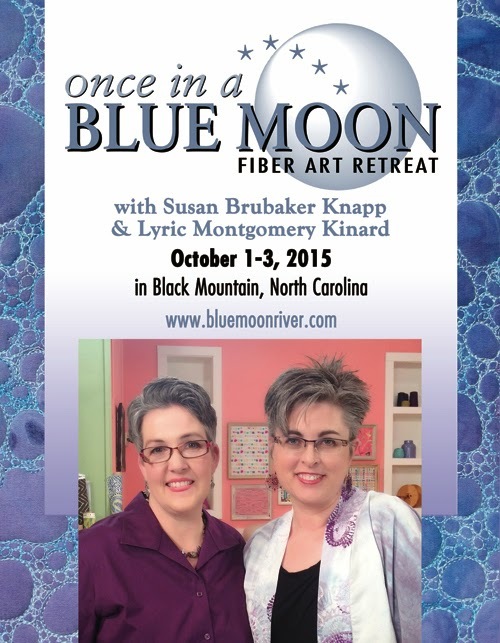 Lyric Montgomery Kinard and I spent some time yesterday brain storming for our 2015 retreat, “Once in a Blue Moon.” It’s going to be Oct. 1-3 in Black Mountain, NC. We are planning an event where students will not only learn new techniques, but discover ways to conquer their artistic fears and inhibitions to create original work that they did not know they could do. We are so excited to be planning something very unique and amazing! It’s going to be a lot of exploring and taking risks in a nurturing environment, mixed with big does of fellowship and friendship (think campfires, sketching, music, photography hikes and group dinners at fabulous restaurants). We’ll be in a gorgeous location, Black Mountain, North Carolina (about a half hour drive from Asheville) at the perfect time of year. I’ll have the registration forms, as well as prices, and all the details, on my website (and here on my blog) next week.